We are pleased to announce we are new members of the Nashoba Valley Chamber of Commerce. Fifth Gen Masonry and Concrete is proud to be an official contractor for U.S. Pavement Services, Inc. - The Nation's Leading Paving and Concrete Service Provider. Concrete division. ​​Fifth Gen is now an accredited Business with the Better Business Bureau. It is an honor to be affiliated with the BBB. 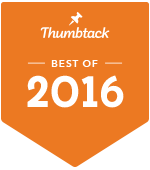 Awarded "Best of 2016" for overall five star ratings from Thumbtack clients. Proud Member of the Townsend Business Association and Fifth Gen's Cynthia is a director on the board of the association, 2016. ​Fifth Gen is a Connected Service Channel Provider.